Antonio Gonzalez Plessmann, who holds degrees from Venezuelan and Ecuadorian universities, has been a human rights activist and militant leftist since the 1980s. A former vice-rector of the National Experimental Security University, he took part in the process of police reform initiated in 2006. Today Gonzalez Plessmann is part of the SurGentes collective and is working with the Pueblo a Pueblo project in Caracas’ San Agustin barrio. In this interview, he presents important insights into the revolutionary potential that Chavismo unleashed during the course of the Bolivarian Process. It’s a potential that, he thinks, could be set rolling again. Hugo Chavez’s taking power went hand in hand with a huge wave of popular participation. For example, the Venezuelan people mobilized for and participated in the Constituent Assembly in 1999 (with its sessions appearing on national television), and they got involved with the literacy campaigns, the Urban Land Committees, and the Communal Councils. In effect, people became active subjects of change. Today, by contrast, there is a logic that is much more “top down,” as is seen clearly in non-participative projects like Gran Mision Vivienda Venezuela and a Constituent Assembly that takes place behind closed doors. Can you explain this historical trajectory? Beginning in 1999, popular protagonism–together with a more equal distribution of wealth and greater autonomy vis-a-vis the world’s hegemonic powers–was a pillar of the political process. Poor people came on stage as political agents. It was the essence of the Revolution, its vitality! Between 2009 and 2012, Chávez upped the ante on that project, which he summarized in 2012 with the slogan “Commune or Nothing.” Picking up on previous experiences of popular organization, Chavez assumed that the [Bolivarian] Revolution’s success depended on expanding spaces of territorial self-government: spaces where people were creating new kinds of sociality from below, based on more democratic economic and political practices. All this formed part of a process of building what Chavez said was a “spider web” of territorial organizations, aimed at a new socialist democracy of a special Venezuelan kind. It was a great experiment in promoting popular power from the state, and it succeeded in mobilizing and raising the morale of a large swath of the country’s poor people. All that was expressed in a programmatic way in Alo Presidente Teorico N° 1 , the 2013-2019 Homeland Plan , and in the “Strike at the Helm” speech . In 2013, however, several crises came together which explain why the government changed course on many issues, including popular power. On the one hand, Chavez’s death spelled the end of the charismatic and strategic leadership that had unified diverse sectors around a popular program. On the other hand, there was a drastic fall in oil prices (lasting from 2014 to 2016), which hindered our capacity to import the intermediate and final goods that the country needs. It’s important to recall that, despite all that was done in terms of social inclusion, the [Venezuelan Revolution] had not significantly modified the country’s productive apparatus during the previous 15 years. That’s to say, the rentier economy was not transformed along the lines of a new leftist model. On the contrary, we became even more dependent on oil exports, which were 77% of total exports in 1997 but 94% in 2014! Another structural problem, which has become very evident today, now that the state has fewer resources, is the widespread corruption of politicians, with most of the corruption involving using privileged access to foreign currency to make real or fake imports. Yet beyond these structural problems, we also have to look at how badly the government managed the economy between 2013 and 2017, mostly through doing nothing or taking only short-term measures. Additionally, we saw a more radical onslaught on part of the local and international right, who saw the country’s economic and political crisis as an opportunity not only to achieve regime change, but, above all, to teach a lesson to the Venezuelan people. Their idea was to “show” the revolution’s failure and prove the impossibility of any effort to overcome capitalism by democratic means. 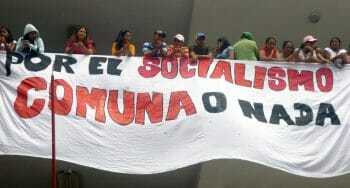 A part of the Chavez leadership took control of the state apparatus and the PSUV. It closed ranks and carried out purges, opting for a strategy that implies the progressive elimination of democratic spaces. That group legitimizes its actions by pointing to the economic war and the conspiracy of the right–which are very real–and then its proceeds to limit various forms of expression of the popular will. In parallel, the bulk of the government’s social action focused on CLAPs and on bonuses [direct subsidies]. The Communal Councils fell by the wayside in the popular spaces, because the CLAPs generated a capillary organizational structure based on what is most important for the people: access to food. Unlike the Communal Councils, where the community chooses its speakers and representatives, CLAP spokespeople are designated by the state and the party. Although participation seems to be waning in Chavismo, there still are wonderful demonstrations of popular power and self-organization–expressions of what Chavez called “territorial socialism.” These range from flagship communes such as El Maizal and El Panal to self-managed initiatives such as the Movimiento de Pobladores or the Productive Workers’ Army. How can we reactivate the latent revolutionary potential of the Chavista project, which is surely part of our collective memory? In the midst of the many crises that affect us as a country, and as leftists and Chavistas, it is important that we stand up proudly to defend our Chavista identity. We should remember that, as poor people and leftists who led the Bolivarian Revolution, we achieved important things: we became political subjects, with class consciousness and an awareness of justice, we distributed the national wealth more fairly, we substantially improved our lives, we achieved an autonomous foreign policy, and we broke with the myth that there are no alternatives to liberal democracy and capitalism. But this is not about adopting a nostalgic attitude toward the past. Instead, based on what we have experienced in Chavismo, we should interpret the current situation and think of ways out. For example, we can contrast Chavez’s sovereign oil policy with the de facto privatizations that are taking place now in PDVSA, and Chavez’s questioning the racist and class character of the Fourth Republic’s security operations can be juxtaposed to the extrajudicial executions that the National Bolivarian Police’s FAES groups and other [state security] forces carry out in popular neighborhoods today. In this way, standing up proudly as Chavistas, we can call into question political deviations from the project that we signed on to, that belongs to us as a people and that allowed us to improve our lives. From that same position, we can also go out to meet the popular sectors that are in the streets today claiming their rights: for example, workers demanding their labor rights, popular communities insisting on public services, sick people claiming their right to health, peasants demanding their right to land to produce food and security for their lives and integrity, etc. Today the Chavista program of popular power no longer can count on the state as an ally, as it was in the past. Recognizing that is the first step. It’s up to the Chavista bases themselves to promote that project and do so from below. 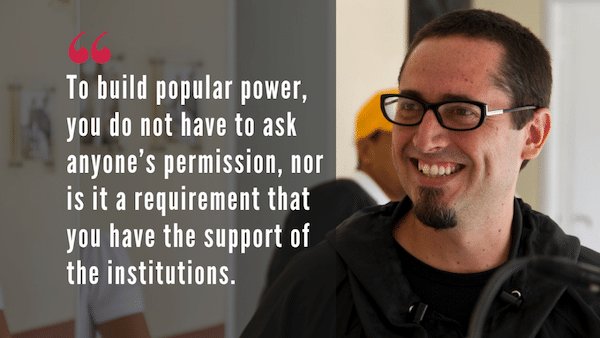 To build popular power, you do not have to ask anyone’s permission, nor is it a requirement that you have the support of the institutions or their legitimacy. In fact, in a global context, Venezuela was an exception, because popular power is [usually] something that is built outside of the state or in opposition to it. One thing that is key to reviving participation today is that our programmatic ideas be connected to material results. Organizational projects and collective endeavors should always be associated with the material solution to daily problems. They should demonstrate that it is possible to enforce one’s rights as a result of self-organization, solidarity, direct and plural participation, mobilizing, and insisting that the state and other-powers-that-be fulfill their duties. At this point in time, there is no room for an abstract political discourse based merely on global proposals–aimed at the society or political situation–if they don’t go hand in hand with solving our immediate problems. Political power and credibility turn around resolving concrete problems through self-organization and accompanied by democratic teaching processes. In all of this, it’s important that popular organizations achieve an economic capacity that enhances their autonomy. The projects that you mention, along with a few others, are deservedly in the limelight, because they are based on real concrete practice–not platforms or short-term results that derive from transitory financing. These projects have broad social support, because they are about people themselves making profound changes in their day-to-day reality. Finally, I believe that it is necessary to build horizontal links across the broad spectrum of projects that are all expressions of popular power; because if they remain isolated, they will be defeated. Linking them requires humility, political maturity and a pluralist logic that permits us to democratically address our differences. We must build trust among the diverse sectors of popular, leftist Chavismo, and we must build it on the basis of doing things together, beginning with small things and later turning to bigger ones. This popular leftist sector, although it does not currently constitute a nationwide political force, nevertheless has an incredible moral authority. That means that it could be the basis of a Chavista regeneration that would relaunch the socialist program, the program of popular power. You are an active participant in a self-organized, popular initiative in San Agustin, a working-class barrio of Caracas. Can you tell us about this experience? I am part of the SurGentes collective, which for the last four years has been working with popular organizations in San Agustin del Sur. It’s a group of women in the collective who do the direct work in the barrio, and they do it with a lot of passion and revolutionary spirit. 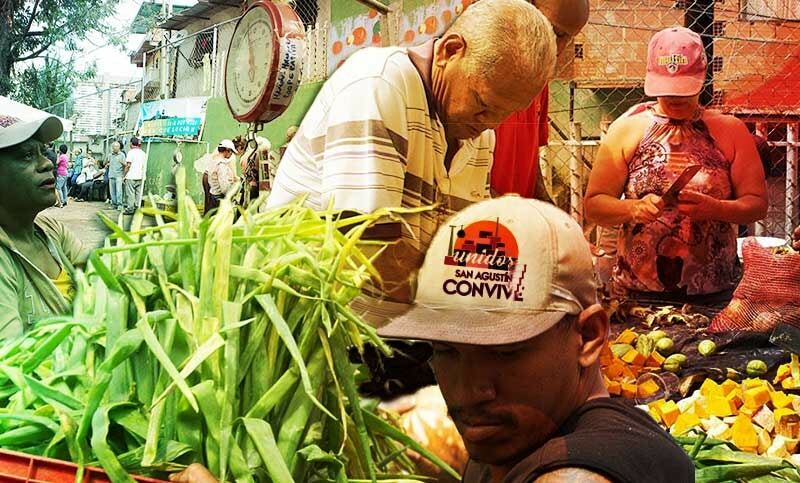 Together with people (mostly women) from eleven neighborhoods in San Agustin they built the cooperative Unidos San Agustin Convive, which distributes vegetables twice a month, at more than 70% below the market prices. This is possible through an alliance with associated producers of the Pueblo a Pueblo network. In this way, we get around the distribution mafias and other intermediaries, bringing together people from the rural areas and the city. The cooperative is very careful with its internal processes, which are based on democracy, pluralism, transparency, rendering accounts, and politicizing militants. We have seen that many Chavistas (and non-Chavistas) have lost interest in popular organization, when they see that there are privileges in the distribution of resources. That is to say, the community’s “representatives” enjoy preferential access to the state and they impose decisions, thereby squashing popular protagonism. The fact that our collective’s members have been very careful to respect [democratic] process is what has allowed the cooperative to grow and take root in the community. People realize that politics here is being done in another way. We are demonstrating, sometimes clashing with the bureaucracy, that in the midst of the crisis it is possible to grow and accumulate forces. 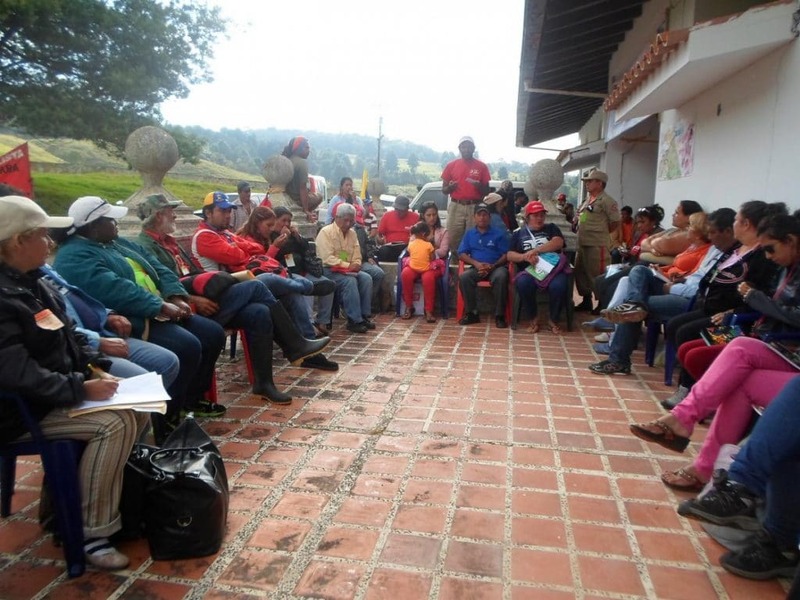 In addition to improving people’s diet, we are raising their political awareness through democratic practices that are part and parcel with the Chavista and socialist project. All this without excluding anybody. Now we have gotten a truck, donated by the ONA [National Antidrug Office], and resources to repair it, and we have started a fabric workshop that is generating an income for the cooperative and its workers. Also we have self-financed daycare three times a week in addition to running a small agroecological farm. Finally, we are in permanent communication with other movements and collectives that promote popular power both in urban and rural areas. Now people are beginning to take a critical look at the whole progressive cycle (sometimes called the “Pink Tide”) that took shape at the beginning of this century in Latin America. Some analysts and groups are concluding that it was an error to have tasted the forbidden fruit of state power. As I understand it, you disagree with this point of view. At present there is a sector of the Latin American intellectual left which, in taking stock of the region’s so-called “progressive” processes, concludes that “it was not worth it,” because today we are more dependent, more extractivist and less democratic than before. That analysis goes hand in hand with a kind of turn away from the state. Instead, we are supposed to commit to the community and to projects that arise from social movements. My aim here is not to present these arguments in a reductive way, since I believe they are important and necessary for the left’s internal discussions. The arguments are much more complex than those I mention here. I only summarize the position briefly to explain my disagreement with the idea of turning away from the state. That’s because, despite it being clear today that seizing power is not the same as controlling the state (which is the key thing in a revolution); still, in my opinion, merely accumulating forces from below cannot secure sustainable and structural changes. The right-wing has never renounced state power, because the state continues to be the locus of a dense network of power relations that crisscross society. To turn away from the state is to lose the game by forfeit. Processes of societal change must be carried out both “from above” and “from below,” without turning our backs on these contested spaces. Nor, in spite of the enormous complexities that it meant for the Venezuelan process, should we be ashamed that the state itself promoted organization (that is, “from above”). That inevitably led to a tendency toward taming and controlling [the popular movement], often through patronage. But we also need to be clear that it was due to this state support–a political decision on the part of the Bolivarian Revolution–that the country’s largest experience of popular organization and participation could take place. What people have learned in this process of politization–even in that soup of autonomy, rebellion, patronage and docility that has developed these days around the state–is a great thing and a very important one. The same goes for the “political” use of oil (administered by the Venezuelan state) to distribute wealth internally and promote spaces of autonomy in the whole region. As we say in Venezuela: nadie nos quita lo bailao (nobody can take what we’ve learned away from us), although there’s a lot that we need to evaluate critically and learn from our own experience.